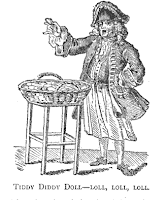 "This celebrated vendor of gingerbread, from his eccentricity of character, and extensive dealings in his particular way, was always hailed as the King of itinerant tradesmen. He was a constant attendant in the crowd at all metropolitan fairs, mob meetings. Lord Mayor's shows, public, executions, and all other holiday and festive gatherings! "Mary, Mary, where are you now Mary? I live, when at home, at the second house in Litttle diddy-ball-street, two steps under ground, with a wiscum, riscum, and a why-not. Walk in, ladies and gentlemen; my shop is on the second-floor backwards, with a brass knocker on the door, and steel steps before it. Here is your nice gingerbread, it will melt in your mouth like a red-hot brickbat, and rumble in your inside like Punch and his wheelbarrow." 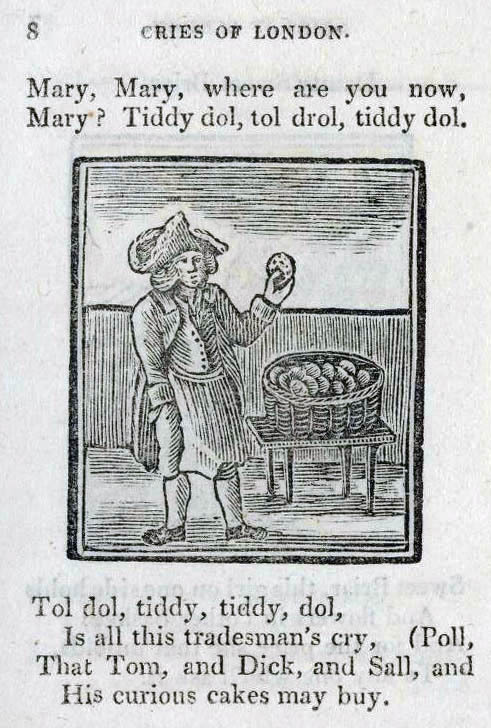 "Mary, Mary, where are you now Mary?" 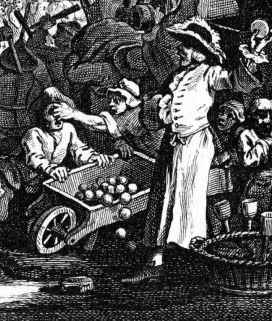 His proper name was Ford, and so well known was he that, on his once being missed for a week from his usual stand in the Haymarket, on the occason of a visit which he paid to a country fair, a ''Catch-penny" account of his alleged murder was printed, and sold in the streets by thousands. 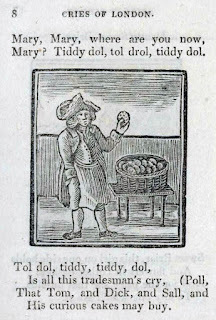 Allusions to Tiddy-Doll, and sayings derived from him have reached to our own time, thus, we still say to an over-dressed person— "You are as tawdry as Diddy-doll," "You are quite Tiddy-doll, you look as fine as Tiddy-doll," he or she is said to be "all Tiddy-doll," &c.
"A boy... is earnestly watching the motions of a vender of gingerbread, at that time well known by the name of Tiddy-Doll, from the burthen of the song he usually sang in commendation of his cakes." 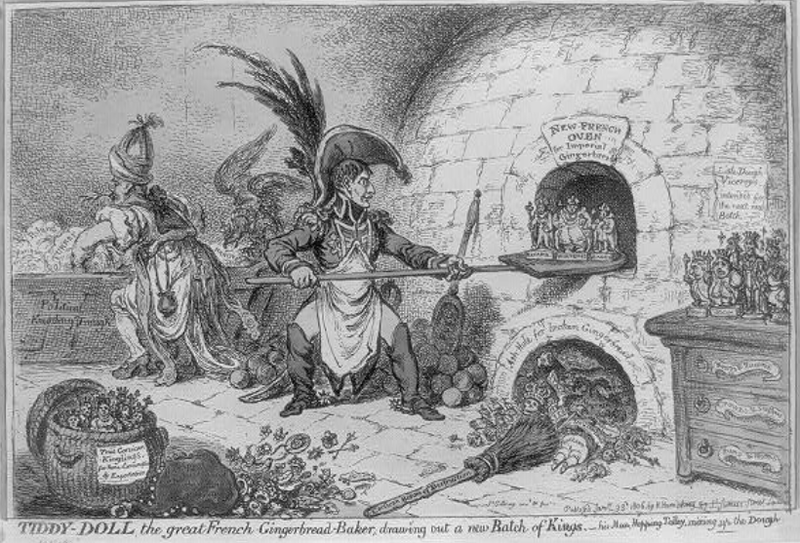 “Tiddy-Doll, the great French gingerbread-baker [Napoleon]; drawing out a new batch of kings - his man, Hopping Talley [Talleyrand], mixing up the dough” by James Gillray 1806 in the Library of Congress online print collection. The Cries of London, for the Instruction and amusement of good children. Decorated with wood-cuts from life. York: J. Kendrew, c1820?